He made this comment in the context of discussion on judicial nominees. But he didn't say that only judicial nominees deserved a vote - he said all nominees deserved a vote. Seems pretty straightforward, doesn't it? There's no ambiguity or nuance in that statement. So why in the world has Sen. Brownback placed a hold on a Bush's nominee? Why would he prevent an up or down vote that he so clearly stated every nominee deserves? The nominee in question here is Julie Finley. She's been nominated for the position of ambassador to the Organization for Security and Cooperation in Europe (OSCE). The OSCE is an organization of 55 member nations that focuses on security - including arms control, human rights, democratization, counter-terrorism, and economic and environmental issues. Julie Finley is eminently qualified for this position. She's now the Trustee and Treasurer for the National Endowment for Democracy. She's also the Chairman of the Project on Transitional Democracies. She serves as Advisory Council Member for the U.S. Institute of Peace, the Brookings Institution, and the Woodrow Wilson Center. She was a Founder and Board Member of the U.S. Committee on NATO, which was established in 1996 as a bipartisan citizen’s initiative to support NATO enlargement. Surely, she's qualified. So why is Senator Brownback abandoning principle, acting against his committed stand of giving every nominee an up or down vote? Why has he suddenly become a relativist - saying that whether or not nominees deserve a vote is relative? No matter that abortion isn't an issue for the OSCE. Nope, it just doesn't matter that her opinions on abortion have no relevance to the ambassadorship. Brownback doesn't like her ideology and that's enough for him to block a vote. Of course, ideology has been dismissed as a valid reason to block a vote on a judicial nominee - but again, that relativistic approach comes to the fore and ideology is apparently a perfectly good reason to block this vote. You know what this means? No pro-choice women in any office requiring Senate confirmation. None. Now, a third of pro-choice women voted for Bush. Julie Finley was a major fundraiser for him. But that doesn't matter. If you want Senate confirmation, you better cede control over your own body. You better endorse a ban on abortion, no matter if your health is at risk. You better click your heels when the ideological police show up. And you better not be surprised when the Republicans abandon principle to target you because you won't abandon yours. It's their way. It's not principled, of course. But that's relative. On Meet the Press yesterday, Ken Mehlman, Chairman of the Republican National Committee, responded to questions seven times by "respectfully disagreeing". In virtually every instance, he provided no rational for disagreeing - it's just that he doesn't believe what others say. The issues on which he made the leap of faith are listed below, with my comments in italics. The conclusion made by former Senator and current Episcopalian minister John Danforth that "Republicans have become the political arm of Christian conservatives". Danforth's op-ed ended with a statement that as a Senator, he had worried every day about the deficit, not the effect gays would have on marriage - that it seemed to be the other way around today. Mehlman's defense was that they do think about the deficit - though they apparently don't care to do anything to keep it from exploding. He completely avoided the question of far-right religious influence on the party. The statement by the Republican gay organization, Log Cabin, on Bush's support for a Constitutional amendment banning gay marriage. Log Cabin said, "...it was actually the White House who was disloyal to the 1,000,000 gay and lesbian Americans who supported him four years ago in 2000. Log Cabin's decision was made in response to the White House's strategic political decision to pursue a re-election strategy catered to the radical right." Mehlman said plenty of gays agreed with Bush - 23% voted for them. He implies that those gay voters based their vote on this issue instead of considering that they may have sacrificed their own interests in favor of national security - which is what the polls show. An NBC/Wall Street Journal poll showing that the public doesn't support privatization of Social Security - 36% think it's a good idea, 56% think it's a bad idea. Mehlman, in his best leap of faith yet, simply says that he disagrees with the numbers, then proceeds to talk about the public's interest in addressing solvency as though it's not a distinctly separate issue from privatization. This is a great example of faith-based reasoning married to obfuscation. One of the President's principal advisers on Social Security said that we should avoid privatization if we want to fix the solvency problem because we can't afford privatization. Again, Mehlman substitutes an answer that addresses the facts - like the multi-trillion dollar cost of privatization - with a recitation of faith: "I think you do want to make sure Social Security is solvent. You also want to make sure our families in the future have more solvency when they retire, that they're financially in a strong position." The conclusion in the Downing Street Memo that there was "little discussion in Washington to plan for the aftermath of military action." After making a completely false statement - that the memo had been discredited by anyone who looked at it - Mehlman went on to "respectfully disagree" with the finding of that memo that post-war planning hadn't occurred. He didn't provide any information on actual plans, but did offer as proof the fact that some things didn't happen (oil fires), said he couldn't deny that there was an insurgency, let us know that Bush thought about the families of those that died in Iraq every day, said that you can't plan for everything, and closed with a note on how important the mission was. But note - he offered no details on who planned what, when. On the claim, made by many including Tillmon's parents, that the Pentagon tried to make Pat Tillman the poster boy of the war, before it became public that he was killed by friendly fire. Mehlman didn't address any of the points raised, just declared his beliefs - he doesn't agree - and acknowledged the tragedy of it all. There's a difference between spin and leaps of faith. If you're spinning, you simply launch into a recitation on the issue. You make a case, no matter how thin, for your position. You may skirt facts and try to change the focus. Mehlman spins plenty, but his spin is inundated with faith-based reasoning. His real answer to so many questions was: "That's not what I believe. I don't have to justify my beliefs, but I'll respect you in your ignorance." At least that's what I heard. It seems to be that what the Republicans are really asking of the Democrats by asking them to abandon the filibuster, is to just give up any hope of actually participating in government. They seem to want Democrats to go through the motions of attending hearings and committee meetings and floor debates. But they want it to be "make work" -- work that looks productive but really has no impact at all. Democrats can't change the outcome of committee votes. They aren't permitted to participate in writing legislation. They can't amend legislation. They aren't permitted to participate in reconciling differences between house and Senate bills unless they agree with the Pubs. They aren't invited to provide suggestions on the business that will come before the Senate. The ability of Democrats to actually represent the tens of millions of Americans who believe they have a representative government is extremely narrow. They can give speeches, hit the airwaves, issue reports, and vote and lose. And they can filibuster. Taking that option away removes the one obstacle that remains in the path of Republican Congressional autocracy. If this country wanted one party rule, we'd have one party. To all the wingnuts on the right who foam at the mouth when a liberal dares speak, to those known and unknown who rant online and off, for whom the end justifies the means, I say stop. Really. Stop spinning and lying and spewing hate. Stop making huge assumptions and try paying attention the facts for once. And get off my back. What am I talking about? I'll tell you. I'll give you a couple of examples of where you've fallen off the deep end. These examples abound and aren't from the extreme depths of the blogosphere. You don't have to go diving to find examples of wingnut ranting and raving. It's on every damn news station and half the radio dial, despite your efforts to say the media is liberal. Let's start with the revered Bob Novak, shill for the administration, megaphone for the right. On Capital Gang, he described Sen. Reid's offered compromise on the filibuster, approving some nominees while the Pubs withdrew others, this way: it's "like going to a concentration camp and picking out which people go to the death chamber." Nice. I'm tired of the Hitler/Nazi references from the right. We get demonized because someone submitted a commercial that compared Bush to Hitlerfor a MoveOn contest. How terrible that we - that collective liberal community you seem to think has one mind - didn't know immediately that the commercial was posted and take it down before we knew it. How dare we take a couple of days to figure that out and remove it. We are so terrible aren't we? But hey, it's perfectly fine for Novak (not exactly a no-name commercial producer) to use holocaust references here, comparing Reid to Mengele. And it was perfectly fine for the RNC to use pictures of Hitler foaming at the mouth in concert with pictures of Gore speaking with passion. You're double standard on Hitler references is getting old. And while I'm on the topic, shitcan the "feminazi" references, would you? Need another example? Well, let's move on to the news that for some reason, you are holding liberal America accountable for the Newsweek fiasco. Forget that this was ten lines in a news magazine that a handful of people were involved in researching and printing. Forget that the lead reporter, Isikoff, was previously best known for his reporting on Clinton - reporting that was extremely critical and far from friendly to the left. Forget that when the rioting first started, the in-field military said that it had nothing to do with the Newsweek sentences, saying that riots like those happened all the time. Forget the detainees reported the trashing of the Koran more than a year ago. Forget that the Newsweek sentences wee seen by the Pentagon before they went to print. Forget all that and choose to believe that Newsweek acted egregiously and caused death and destruction in Afghanistan. Then remember that THERE IS NO VAST LEFT WING CONSPIRACY. Liberals, those of us who reside from 1 to 180 degrees apart from the conservative agenda really didn't have a damn thing to do with the Newsweek sentence. Got it? Newsweek isn't the arm of liberal America. It's not even liberal - a statement that you're undoubtedly scoffing at but will surely be at a loss to disprove. Newsweek is one magazine among many that's happy to print whatever story gets people to buy its product. This is the magazine that whose cover story "Lawsuit Hell" incited so many to blindly support tort reform. It syndicates a column by conservative hero George Will. It spilled endless ink on every rumor that swirled around Clinton and is deemed by many to be a critical factor in the ensuing impeachment. It's a magazine trying to make money on news stories, not a liberal megaphone that counters the endless shouting pundits and radio hosts you have - like Rush, Hannity, O'Reilly, Novak, Will, Coulter, Savage, et al. So to those conservatives calling their favorite radio hosts and blaming liberal America for Newsweek's actions, I say "SHUT UP". You can be as condescending and judgmental and assuming as you want to be and it doesn't change a damn thing. It doesn't change the fact that we liberals do know what's going on in the world, though you think we don't. How you think about us doesn't begin to weaken the legitimacy of our reasons for disagreeing with you. I'm sorry to break the news, but we aren't naive. We aren't misinformed. We don't have a Pollyanna view of the world, a need for a global permission slip, or a misplaced sympathy for terrorists. We don't hate God, America, or its military. We think you're misinformed. We think Iraq has nothing to do with the war on terror - at least it didn't before we invaded. We think the government should care as much for the the average citizen as it does the wealthy and their corporations. We think protecting the environment is our gift to our children. We think that judges shouldn't be beholden to the legislators that are owned by those with deep pockets. We think faith is a personal matter and not a political platform. We think tolerance is the equivalent of respect and that trumpeting intolerance as we've heard Dobson and Falwell do is heinous. We think government shouldn't intrude in our personal lives - straight or gay. We think guns in the wrong hands are dangerous and it's simply smart to work together to keep them out of the wrong hands. We think the UN is flawed but that it's not a bad idea to have a place where countries across the globe meet and engage in dialog and try to come together. We think ending the slaughter in Darfur is a worth our real time, attention, and effort. We think that corporations aren't perfect, that outsourcing the government to them is insane, that turning insurance into investment means it isn't insurance anymore, and that actual debate in Congress is a good thing. We think we were lied to and that a government that treats the public with no respect doesn't deserve ours. We are tired of being told that unless we agree with you then we hate our country. We're tired of being told that unless we support the invasion of Iraq we hate the military and don't support the men and women in it. We're tired of being told that we don't believe in anything, that we have no values. We're tired of being told that unless we abandon what we do believe in and become more like you, we're simply delusional fools. We're tired of listening to you whine about how oppressed you are, how much you're under attack. We're tired of being attacked. And we're tired of marveling at your ability to delude yourself. We're tired of your hypocrisy. At least I am. You are NOT an oppressed minority. You are NOT the moral arbiter of all things good and right. You do NOT have a corner on truth. You are NOT the sole proprietors of all things patriotic and faithful. You are NOT a walking testimony to that which you preach. You ARE hostile. Judgmental. Arrogant. Unkind. Loud. Tiresome. Boring. And sadly, threatening. You do yourself and your country a disservice with your raving wingnuttery. I wish you'd stop. He made the comment in regard to the filibuster, but I must say it seems to describe his opposition to gay marriage, abortion, and other alleged social "evils". You see, it's all about controlling our desires. And bad Republican that he is, he actually thinks that's the government's job. I miss the Republicans of old who wanted small government that left us alone. I stumbled across the text of a speech Tom DeLay gave a year ago to the Cuban exile community in Miami. Here are a few excerpts that I found surprising. The war on terror is a war against evil, and it is therefore a war against Fidel Castro. For ninety miles off our shores is an island prison, a hub of international terror, and a founding partner of the Axis of Evil. No corruption or vile oppression that exists today in Iran or the Palestinian Authority did not first exist in Castro's Cuba. And no despot who seeks today to shackle man's will to freedom has yet surpassed the brutality, cowardice, and greed of Fidel Castro. Castro's regime is the lifeblood of terrorist activity in the western hemisphere. If we have a hub of international terror 90 miles from our shore, a founding partner in the Axis of Evil, run by a tyrant who is worse than any other, worse than Saddam, a state that is the "lifeblood" of terrorist activity in this hemisphere, then I can't imagine why we didn't invade and disarm this terrible threat before targeting Iraq. What were we thinking? This speech is pure pandering, telling people what they want to hear. DeLay doesn't really believe that Cuba is the "lifeblood of terrorist activity" in the western hemisphere. How do I know? Well, he certainly hasn't done anything to try to get the government to take action against this "state that sponsors terrorism" - a key component in the neocon war. And we do know that al Qaida is the enemy. But can you imagine DeLay smoking an al Qaida cigar? Nope, me neither. 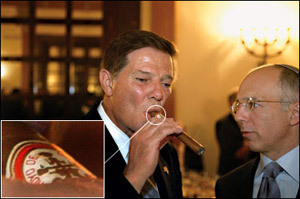 But here he is in the summer of 2003, happily smoking a Cuban cigar while visiting Israel. I don't think he's really all that committed to the idea that Cuba is a key player in the war on terror. If he is, then he ought to think twice before he enjoys the products produced by terrorist nations. Don't you think?